President Trump's victory last November set off a massive party on Wall Street that is still going strong today. 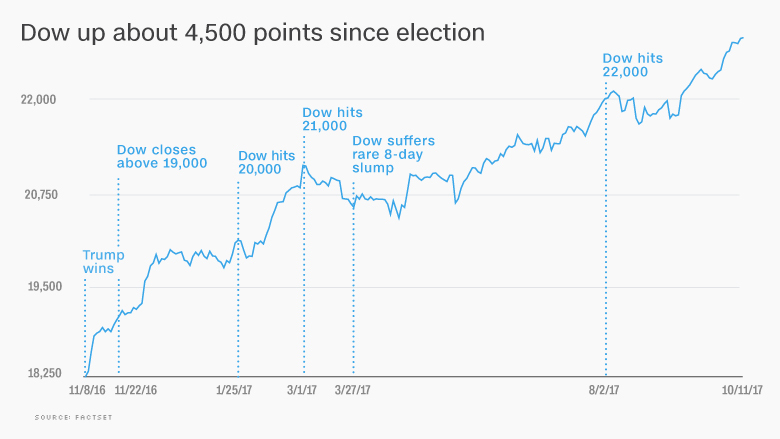 The Dow has spiked an incredible 4,500 points since the election. As CNNMoney has reported frequently, that 25% surge is based in part on Trump's promises to slash taxes and regulation. Trump, who warned of a "big, fat, ugly bubble" before he took office, brags about the red-hot market now that he's in charge. He did it again on Wednesday, cheering the "virtually unprecedented Stock Market growth since the election." The market's cheerleader-in-chief never mentions that he inherited a bull market -- one that began long before "Make America Great Again" hats started showing up on the campaign trail. The bull market in stocks started in March 2009, near the end of the Great Recession. This market upswing is now 103 months old, making it the second-longest on record. Trump can claim credit for 11 months at most, if you start counting after the election. The other 92 months of upward trajectory took place under President Obama. Taken as a whole, the Obama-Trump bull market is historic as well. 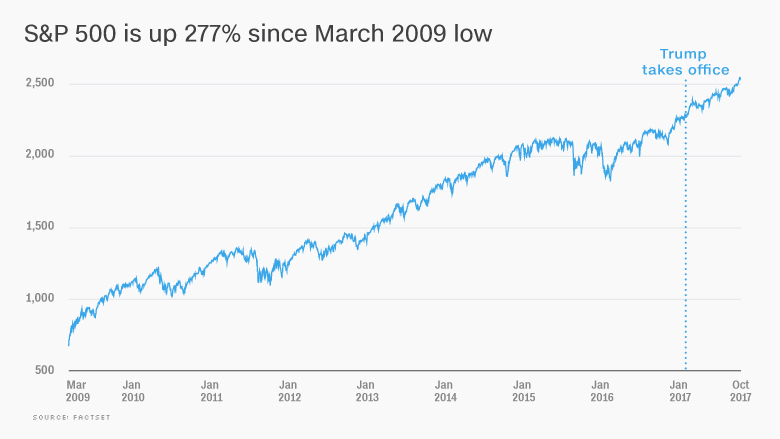 The S&P 500 has soared 277% since bottoming in March 2009 thanks to the improving economy and extremely-low interest rates. That's good for No. 2 among all bull markets, according to Bespoke Investment Group. Of course, the vast majority of those gains occurred under Obama. The stock market more than tripled during Obama's eight years in office as the U.S. economy recovered from the recession. Nonetheless, Trump often points to record highs on Wall Street as a barometer of his success. "Stock Market hit an ALL-TIME high!" Trump tweeted on October 5. He's right that the Dow has never been higher. In fact, the Dow has notched 65 records since Trump's election. The S&P 500 isn't far behind with 52 records. Both have benefited from Trump's promises of tax cuts as well as strength in corporate profits and the domestic and global economies. No matter the cause, record highs were a regular occurrence during Obama's second term -- even as Trump was bashing the economic track record of the 44th U.S. president. In fact, the S&P 500 hit 127 all-time highs under Obama, according to Ryan Detrick of LPL Financial. Congratulations to Obama on building a strong economy. There are 49,500,000 people on food stamps. A historic record! None of those presidents talked up the day-to-day movements of the stock market like Trump has. That's not just because Twitter didn't exist during most of those presidencies. 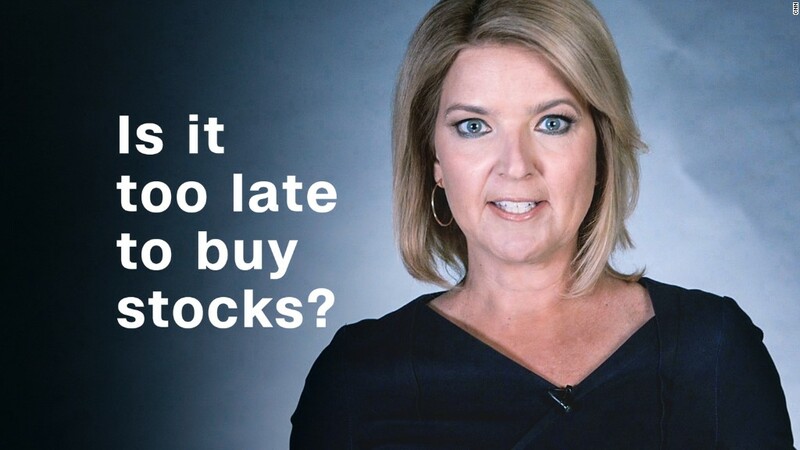 The risk is that taking too much credit for the notoriously-fickle stock market will make it more difficult to avoid criticism when stocks eventually retreat.